Abstract: Currently, time-consuming serial in vitro experimentation involving immunocytochemistry or radiolabeled materials is required to identify which of the numerous Rab-GTPases (Rab) and Rab-GTPase activating proteins (RabGAP) are capable of functional interactions. These interactions are essential for numerous cellular functions, and in silico methods of reducing in vitro trial and error would accelerate the pace of research in cell biology. We have utilized a combination of three-dimensional protein modeling and protein bioinformatics to identify domains present in Rab proteins that are predictive of their functional interaction with a specific RabGAP. The RabF2 and RabSF1 domains appear to play functional roles in mediating the interaction between Rabs and RabGAPs. Moreover, the RabSF1 domain can be used to make in silico predictions of functional Rab/RabGAP pairs. 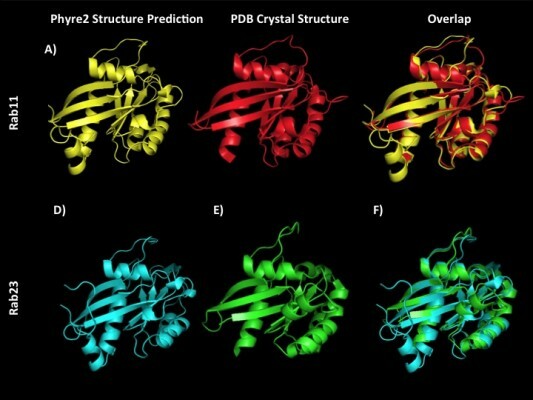 This method is expected to be a broadly applicable tool for predicting protein–protein interactions where existing crystal structures for homologs of the proteins of interest are available.